Marriot the Great Eater, ca. 1840. Engraving. Graphic Arts Collection. Gift of Dickson Q. Brown, Class of 1895. Here to your view’s presented the great Eater, / Marriot the Lawyer, Grayes-Innes Cormorant; / Who for his Gutt is become a meer Cheater: / Those that well feed him, Councell shall not want. 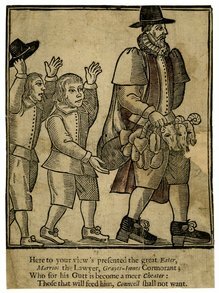 The figure has been identified as John (or William) Marriot, a lawyer who gained a reputation for the food he consumed. 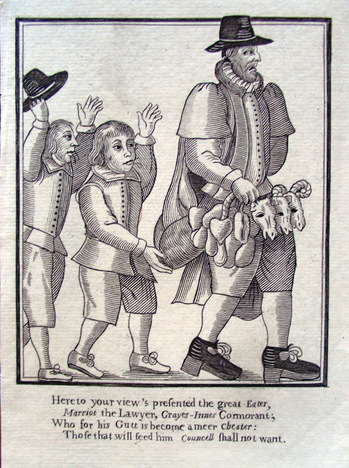 At least five pamphlets and two woodcuts were published in the 1650s referring to John Marriot, the Great Eater including The Great Eater of Grayes Inn. His life by G. F. (1652); The English Mountebank (1652); A Letter to Mr. Marriot, Wherein His Name is Redeemed from the Detraction of G. F. (1652); The Great Eater of Greys Inn, or the Life of Mr. Marriot, the Cormorant (1652); and The Trappan Trapl, or the Relation of a Cunning Knave named John Marriot (1657). The English mountebank: or, a physical dispensatory, wherein is prescribed, many strange and excellent receits of Mr Marriot,: the great eater of Grays-Inn: with the manner how he makes his cordial broaths, pills, purgatious [sic], julips, and vomits, to keep his body in temper, and free from surfeits. With sundry directions, 1 How to make his cordial broath. 2 His pills to appease hunger. 3 His strange purgation; never before practised by any doctor in England. 4 The manner and reason, why he swallows bullets & stones. 5 How he orders his bak’d meat, or rare dish on Sundays. 6 How to make his new fashion fish-broath. 7 How to make his sallet, for cooling of the bloud. 8 How to make his new dish, called a frigazee: the operation whereof, expells all sadness and melancholy. In the nineteenth century, an engraving was made reproducing the earlier woodcut and it is this intaglio print that is held in the graphic arts collection.